What? Do my eyes deceive me? Could this possibly be true? 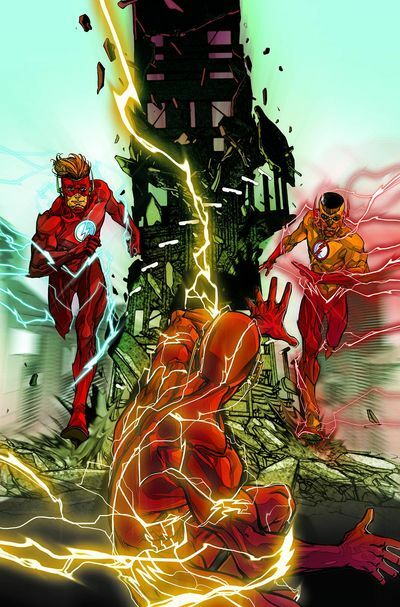 There are two of them, two Wally West's, one sporting a yellow outfit whilst the other sports a red one! Holy silver age pastiche! I've got to see this. As it's going to be created by Joshua Williamson, Jorge Corona, Felipe Watanabe, and published by DC Comics. It's November, 2016, and it's time for the Flash double-review. TO QUOTE A Drunk Person: 'Ahh zair two ov you or am I... bluuurrrrg!!!'. On occasion I find that DC Comics aren't that spry at partnering up writers with artists. Or to be more specific about it, artists and their respective story-lines! Take issue 9 of The Flash for instance. Basically the overall narrative centers on the younger version of Wally West (for the sake of simplicity I will now refer to him as Wally Number 2), and in loose terms highlights how he interacts with his mentor, the Flash, whilst showcasing his first meeting with his older counterpart, Wally West Number 1, also known as the other Flash, the one with the sprig of red hair on top. Anyway, as I was saying, at the start of the book we are presented with a scene where both Barry and Wally Number 2 are having some good old fashioned 'down time' with Aunt Iris. When suddenly, out of the blue, news comes in that there's a major problem happening over at the Keystone Bridge! So fearing the worst, each person makes their usual excuses, blah-blah-blah, before rushing off to see how they can help. At the scene, the narrative then directs its focus towards the Flash and Kid Flash partnership, not Iris, with the former telling the latter what to do while the latter just does it. When suddenly, again, out of the blue another surprise occurs! 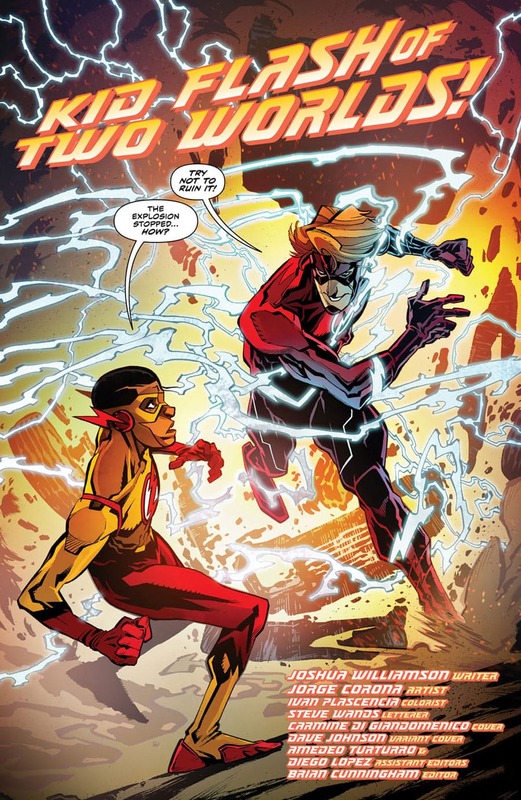 This time though it's Wally Number 1, also known as the Flash with the hair, who introduces himself to his younger counterpart, just before something else, shock-horror, ends up happening. Well, by this stage of the story Barry unexpectedly gets possessed by forces beyond his control, forces which compel him to say and do things he doesn't usually do. 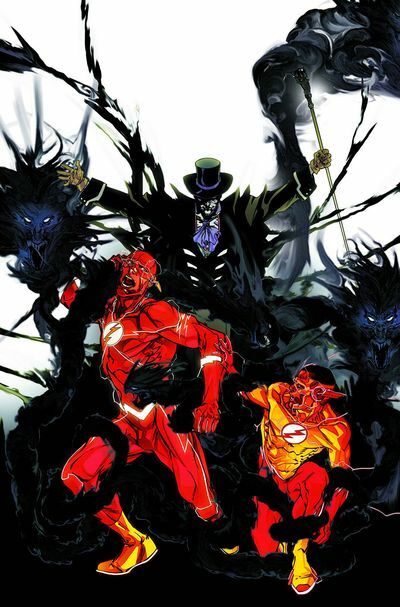 Such as, having fragmented visions of the future, putting down Wally Number 1 for trying to take over his mantel, and most notably of them all, telling Wally Number 2 that his Uncle Daniel, also known as the villain Zoom, is his real father. Ouch! That must have hurt. But don't worry. By the end of the book some of these issues are eventually resolved -- more or less -- and in a round about way this brings us right back to what I said at the start of my review: DC's inability to assign appropriate artists to story-lines. You see, my main problem with Jorge Corona's art-work, as opposed to Joshua Williamson's story-line, is that his art is light, cartoonish, and boarders on the Hanna Barbera (all good things, considered). Where as Joshua's story, on the other hand, calls for art-work that's more gritty, down to earth, bordering on the Dan Jurgens or Jim Lee! Something more normalized in tone, which is able to convey emotion without making it seem too overt or too forced. So to me, issue 9 of the Flash came across as a stage play, theatrical and over performed, although I would have preferred it if it were a Scandinavian drama, understated and full of pathos. Something else about this issue I wasn't too keen on was the way in which certain key event's happened one after the other after the other. But then again, I suppose these things had to be crammed into one tale! Especially since issue 10 is now coming a calling, THUD! Yes. We are here, dear reader: Issue 10 of the Flash. Or as I'd like to call it: Why is Wally Number 2 such a naughty boy? 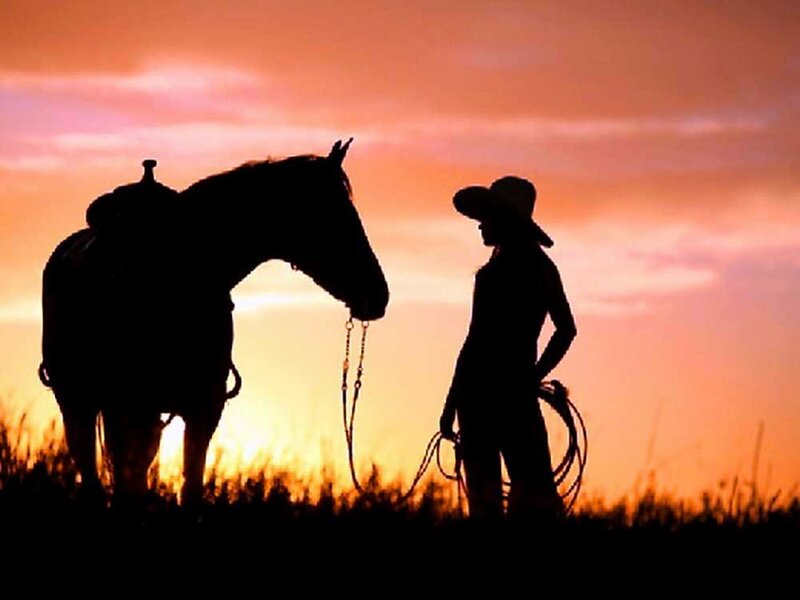 Now before I answer this question please allow me to tell you how it all starts off. When the book begins we see Barry and Iris both jogging together in the park, using this casual jaunt as a pretense for Iris to figure out who's been mugging people in the vicinity. Yet the funny thing is, once their jaunt has finally run its course -- kind of -- Iris then tells Barry that she's annoyed with her younger nephew, Wally, and explains to him that he's been skipping school, missing classes, and generally neglecting his academic studies. Barry is obviously unhappy to hear this from Iris, and comes to the conclusion that Wally must be neglecting his school so he can hang out with the Teen Titans and embrace his new role as Kid Flash. 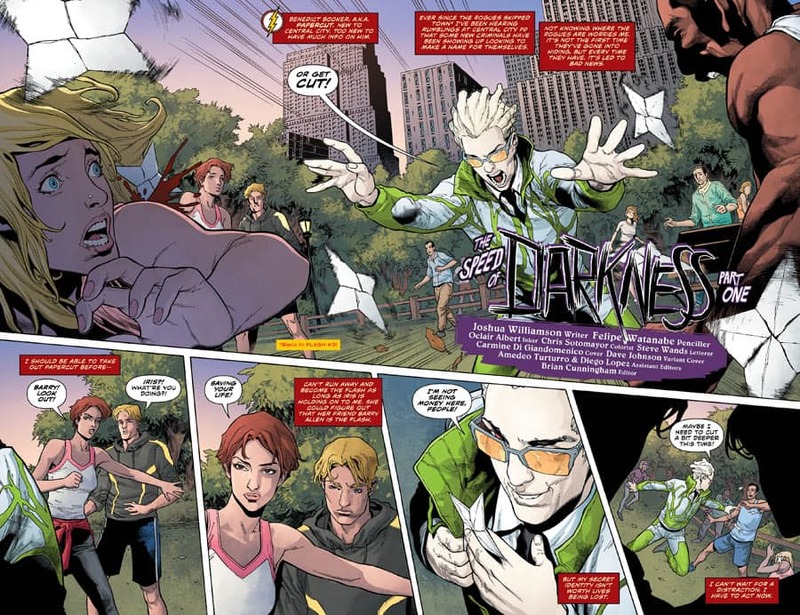 And to justify this point, from a nearby park bench, surprise-surprise, the mugger, a silly looking villain called Paper Cut -- spit-spit -- attacks Iris, Barry, as well as the other people around them, thus paving the way for Wally to enter the scene and, well, I'm sure you know the score, Pow-Pow-Pow, Ouch, let us now move on. Personally speaking, I'm not a huge fan of these quick and obvious scenes which set up, convey, and then pay-off a pretext, doing so without really explaining why Wally was in the area, or why Paper Cut made himself known at that specific moment in time! This is too coincidental for my own liking, or as I said, too obvious. Although, with some benefit of hindsight, it's main saving grace was a question it addressed as soon as the scene played out. Cut to a scene outside Wally's High School, Whatever it's called High, where Barry explains to Wally how he should be open and honest with him, and never tell a lie. But Wally, in turn, comes back with a right humdinger, '...if you want me to be honest and open with you, how come you don't tell me who you really are?'. Slap! He's got a good point there, doesn't he? Plus I'm sure this quandary will come to a head sooner or later! Well, why doesn't Barry tell Wally and Iris who he really is? I'm sure his reasons aren't based on the recent death of Meena, a fleeting character that he fell in love with and 'came out' to within a span of one singular story-arc! I mean, he's known Iris much longer than her, and with the recent return of Wally West, hopefully, touch wood, so too will his memories of they're shared romance together. Anyway, moving on to the end of the book and this is where the whole return of The Shade plot-line comes out to play. Sporadically sewn throughout the story -- a bit at the beginning, a smudge in the middle, plus a big dollop at the end -- we see glimpses of The Shade popping up all over the place, with highlights conveying who he is, what he looks like, plus what he might be up to in Central City. Yet overall, the plot doesn't really come to the forefront until Wally, once again, disobeys Barry and Iris's orders by donning his mantle and, well -- Shazam! -- checking out who that shadowy figure is, lurking around in the dark. Overall I would like to express a lot of good will towards this new Speed of Darkness story-line. Felipe Watanabe's artwork is great in places, plus I do like the way the new Wally is developing as a character in his own right. As for The Shade on the other hand? Well? Time will tell, eh? Time will tell. The one thing both of these issues have in common, that's issues 9 and 10 for those of you keeping count, is that they both focus on people -- namely, young Wally -- who have a feeling of loneliness, stranded in the dark, hoping that someone can locate them and bring them back home, hint-hint Barry! Picture provided. Write rude words on his uniform. Brush his teeth with acid. Teach him how to dance incorrectly. Zap him into a dark dimension full of shadowy beasts with good dental plans. Show him naughty pictures on the internet. Explain why he should always vote Trump. Slap him with a fish.